Disclaimer: This story is a work of fiction for entertainment purposes, based on the characters from "The Magnificent Seven." CBS and Co., Trilogy Entertainment, and MGM had them first. No infringement of any copyrights intended. Any references to locations or people are for story use, and do not intend to depict any real place or person. 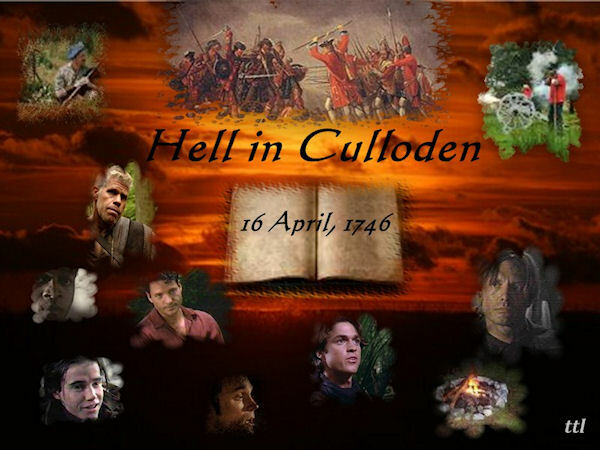 Summary: The contents of this story revolves around the fateful battle between Highlanders and English soldiers on the fields of Culloden, Scotland. The names of the seven in this tale are not the same as we all know them. I gave them Scottish names to fit the period of time and place I am writing them in. Author's Note: I am not an expert historian, and this is fiction. After researching the events involved, I decided not to attempt a specific recounting of historical facts. Any mistakes are mine. Acknowledgements: Sherry thanks for the beta and the encouragement to further ‘develop’ my writing skills. Thanks most of all for your friendship. Hell is the only explanation for the excruciating pain I experience, as well as the odd red hue that clouds my distorted vision. Surely, the fires of Purgatory are advancing steadily on my location. I welcome the devil’s arrival if it means the pain I am suffering will end, but given my understanding of what devious delight the devil takes in exacting torment on unsuspecting folk, I suppose it is foolish to expect any kind of mercy. While I wait for the horned beast to claim me, I begin to take stock of my wounds. Sharp pinpricks stab my skull, making it extremely difficult to form coherent thoughts. Every muscle in me body throbs, my joint aches, and numerous cuts, gashes, and bruises cover my body from head to toe. I try to differentiate between the aches and pains I am feeling to find out which of my assorted injuries are most serious, and locate a rather intense and fiery sensation in my right side. Even slight movement is agony, as I press my hand against it, and come away with fresh blood. I must do something or bleed to death. Wry laugher makes me wonder about my absurd thoughts, and question my sanity, as I am certain my death is already imminent. Still, self-preservation resides within me, and has since I was a young lad sitting on my Da’s knee. I cannot lie here and do nothing to aide myself, even if it proves futile. I struggle to tear a piece of my tattered and bloodied shirt, using it to stop my blood from flowing freely into the ground. It takes more effort than I think possible to complete my task, and by the time I finish, my breath comes harder, and my arms throb with new aches. Resting while I await death to claim me, my anxiety grows minute by minute. I believe I will go mad with the uncertain timeliness of my expiration. When a good amount of time passes and the devil has not claimed me, I realize my true torment will be to survive the bloody skirmish that occurred this day, and live with the blood of others on my hands for the rest of my life. Once this new thought took hold, I decide I will not lie like a coward on the field any longer. I am a Lachlan and a Highlander. Damned if I will wallow in self-pity. My resolve set, I try to raise myself into a sitting position, and find that from the waist down I cannot feel anything at all. A wave of panic floods over me at the possibility that my legs are useless and I contemplate what I will do if I am indeed a cripple, and unable to fend off the enemy. Get hold of yeself man! I will not give into those dark thoughts, and will my body to comply with my wishes. Accepting nothing less than its full mobility, I set my teeth, tighten my jaw, and try again. I manage this time to rise into a sitting position, and as I do so, something shifts on my legs. Suddenly I feel a strange sensation spike through my hips and thighs, sending relief flooding through me. I gaze down the length of my body, and see a dragoon lying across my legs. Recalling the fierce hand-to-hand battle I encountered before losing consciousness, I feel a measure of satisfaction fill me that there was one less English soldier left in the world. However, the problem at hand is the dead man facing me, his half-open eyes turn inward, and his skin is a dull gray. Revulsion fills me and I shove at the corpse, crying out as red-hot pain spikes through my torso, and I fall onto the ground. My breath comes in gasps as I wait for the intensity of the pain to ease. When it dulls enough for me to think clearly again, I press my hands flat against the ground, and begin to squirm my way out from under the carcass. It takes some doing as I found myself amazingly weak due to loss of blood, but finally I manage to pull myself free from the dead dragoon. Resting a few moments before I attempt to sit up again, I manage to shrug out of the tattered pieces of my shirt, tearing strips to place against the wound in my side, and fasten it tightly in place. Slowly I rise to my feet, wavering between falling and standing as my still numb legs decide whether they will collapse or hold me upright. Once I am certain that I can remain standing, my gaze sweeps outward. Horror and despair fill me as I take in the devastation. Crumpled bodies of Highlanders and English dragoons lay strewn across the heather covered countryside as far as I can see. Splashes of bright red lay in twisted piles alongside the colorful plaids of my kinsmen and the clans of my fellow Highlanders. Anguish floods through me and I drop to my knees as the full impact of the carnage hit me. Men I know, of every clan, lay dead around me. Their faces wear masks of blood, brain matter, mud, sweat, anguish, and horror. We are defeated. Scotland has fallen. The superior weapons of His Majesty’s Army have vanquished an army of Highlanders, in less time than I believed possible. Those, like me, who have survived, are now outlaws, traitors to the English Crown, and will therefore be hunted down and killed. Gavin. Baen. Ian. Logan. Evan. Jackson. Do they survive? Have my brothers in arms met their deaths on the rolling hillsides of Culloden as so many other Highlanders we knew? Gavin and I are brothers by choice, and despite the difference in our ages, have been inseparable from the very beginning. I call him Little Hawk. We hold a special connection between us, and have from the moment my Ma and Da brought the young lad home to live with us. Gavin? Are ye there brother? There is no answer…I hear only the sounds of the dead and dying. Surely, if Gavin were still alive, he would reach out to me, anxious, as I am to connect with him. My gut twists in pain, not from my wounds, but the devastating sensation of loss. My thoughts turn to the six men who became my brothers in arms. Though we do not all share blood, we are brothers of the heart nevertheless. We swore loyalty oaths to one another and to our country. A man’s word is his pledge and once given, a promise will not be broken, even upon the point of death. To a Highlander there is nothing more binding than an oath. Baen. My kinsman is a lover of life and women. His boisterous personality belies the soft gentleness of his soul. He is ever the optimist, and always spoiling for a fight, but he seldom says an unkind word to anyone, unless he see an injustice done towards a woman, child, or animal. Logan. He is a man who does not fully understand the wonderful gift of healing he possesses. He only does what he knows and feels to be right when tending to someone, and rarely loses anyone. Jackson. A giant of a man, many men fear him on sight, but he is a deep thinker. He is our spiritual leader, the one we seek when we are troubled, and who never fails to assist us with our problems. Evan. Since his plaid is always impeccably neat, we gave him the nickname ‘peacock’, but in reality he is a cunning, sly fox, who has a wit about him, which gets some, or all of us out of trouble more times than I like to think about. Ian. Young Ian was so eager to join us, despite his inexperience in fighting. He has a courageous and loyal spirit that endears him to the rest of us, especially Baen, and despite my reservations, we accepted him into our lot. I close my eyes against the flooding of tears that fill them. How can I go on, knowing that my six faithful companions live no more? I still, thinking in my grief I have only imagined the familiar voice in my head. The voice came again, this time more insistent, and I recognized a gentle prodding my mind associates with it. Dare I hope? Was I? Relief floods through me as I realize I am not imagining Gavin’s voice in my head. He lives! I cannot finish the sentence. Hope that the rest of my brothers have survived the massacre of this day eludes me. Aye. We all live. Baen an’ Evan be with me. We are on our way to ye. Jackson be with the Healer and young Ian. The lad is in bad shape and canna be moved jest yet. Kin ye walk? I take in this information with a renewed sense of hope. My brothers by oath and bond are alive and that was cause for celebration, even amid the devastation and loss of the rest of my clansmen. A sudden image fills my head and I know Gavin is showing me the wooded location where Logan and Jackson tend to the wounded Ian. Then I received an image of Gavin, Baen, and Evan scurrying carefully over the countryside, a sense of wariness and urgency in their movements. I understand what Gavin is trying to tell me. We are not the only ones who have survived the fighting. Sassenachs were still around and I and my brothers will have to tread carefully to prevent capture. I will see ye soon. I pick up my claymore that lay a few feet away, and I start down the hill slowly in their direction. My keen eyes peer cautiously around, looking for any movement which will indicate the advance of an enemy approaching. In the fading light, I stumble over a body or two and nearly land on my backside, but I struggle to my feet again, and continue on my path toward reunion with my kinsmen. I settled my battle weary, but healing body, against a pallet of furs and wince as my aching muscles protest. I felt a sting of pain from my side where the gash from the dragoon’s sword, is on the mend. I glance quickly around and am relieved that none of my brothers heard me. I know if one of them were aware that I was still in pain, they would seek out Logan to come look at me again. Young Ian’s condition is still critical and require Logan’s undivided attention. We almost lost him twice over the course of the past few days, but his strong will, combined with Logan’s healing talents and Gavin’s ability to channel their collective energy into Ian, pulled their youngest back from the brink of death. Even though Ian’s condition is still serious, Logan assures us the worst is behind us. The news buoys our waning spirits. The moods of my men and I were solemn. We all grieve for the loss of our fellow Highlanders, and for the defeat of our valiant cause. Losing is not something any of us are accustomed to, and this loss is a grievous one. Still, we cannot help rejoicing that we are all together. Even though six of us are walking wounded, and Ian is still flat on is back, we are aware that it is nothing short of a miracle that we all survived the bloody carnage. Where the brothers of my heart were concerned, miracles and destined fate direct our lives. Two years ago, my life forever changed when young Ian knocked on the Castle’s door looking for work among my guard. I did not know then that his appearance was going to set into motion our joined Legacy. In addition, a leather bound ancient tome was passed down to me from my ancestor, Angus Lachlan. The appearance of the old Highlander at the foot of my bed one stormy night less than a year past scared the hell out of me. I listened with wide-eyed fascination as the Lachlan introduced himself and shared the tale of our joined Legacy. I could not tell if I was dreaming or not. It was only when I awoke the next morning and found the ancient tome lying on the bed beside me, that I believed everything Angus told me was true. It certainly explained the mysterious bond that I hold with my men. Baen and Gavin, of course, are kin to me by distant blood and adoption, but I have no such tie to Jackson, Logan, Ian, and Evan, except for the oaths they swore to me. Still, that does not encompass the whole of our understanding and acceptance of one another. From the moment we all met, there has been a connection between us even blood or a vowed oath could not compare to. I remember again every word Angus used that night to tell me of our shared Legacy. “We were all great warriors who were once blood brothers. Dark forces used sorcery against us to destroy our physical bonds in the earthly realm, believing it would end our quest for righteousness. Never again were we blood brothers, instead we were reborn as strangers destined to reunite with one another time and again. Each of our lives is distinct from one another until we acquire our predestined awareness and hone our inherent skills. When these preordained elements of our existence are in place, correlated memories of our past begin to rouse within us. It had taken a few days before I could gather my men together and share with them the tale I learned from the apparition of my ancestor. I expected them to think it a joke or consider me insane, but instead each told a similar tale of one of their deceased kinsmen visiting. I was the only one given the book though, and Jackson had decreed it was because I, as Clan Chieftain, was destined to lead them upon this quest of ours. I am Cameron Lachlan, of the Clan Lachlan. It is with a weary heart that I write of our defeat at Culloden. The honorable cause for which we have valiantly fought for has died along with thousands of our fellow Highlanders. My men and I now are called outlaws. The Sassenach willna stop until they round up all of the clan leaders, strip them of their titles and lands, and kill them. I donna where we will go from here. My brothers in arms and I canna go back to the keep for surely the Sassenach will be awaiting us there, and I willna endanger my loyal servants. Their lives are more valuable than mine. The future is cloudy and I donna what Lassie Fate has in store for us, but I do know one thing for certain. Regardless of what happens, we will face it together and preserve our legacy for the next generation. I set down my pen and lay the book flat on the ground so the ink can dry. I reread the words I wrote and know the truth in them. Whatever happened, my brothers and I will stand together.